Laura learned to sew from her Italian grandmother, who emigrated from Sicily. Fabrics are second nature to her. She is passionate about their feel, the artistry of their weave, and the richness of their color. The quality of our pillows reflects her diligent attention to the fabric and sewing details. Laura is constantly discovering new ways of using the pillows in treatment. Whether for grounding, boundary work, containment, nurturing, or soothing, Laura’s creativity is limitless. 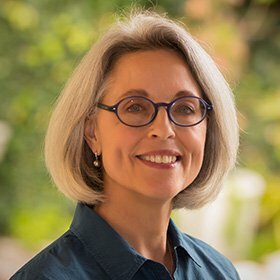 She has worked in the fields of stress, pain management, and self-regulation for 26 years and trained in many styles of bodywork starting with her first love, Esalen massage, followed by craniosacral therapy, and, rounding off her understanding of the body, the osteopathic approach of Ortho-Bionomy. Laura uses Somatic Experiencing® (SE™) and touch to treat attachment and developmental trauma. Her understanding of developmental trauma has been deepened by her studies of four important approaches: 1) Bodynamics, a body-centered approach that focuses on the developmental stages; 2) The NeuroAffective Relational Model (NARM), which addresses attachment and developmental trauma as a major cause of identity problems; 3) Kathy Kain’s Touch Training for Therapists, her Resilient Child Training, and her independent classes for bodyworkers; and 4) NeuroAffective Touch®, integrating touch and bodywork with psychological development. She is also a graduate of the Addictions Studies program at Pierce College. Laura has a private practice in Beverly Hills, where she supports clients in the exploration of somatic awareness and helps them experience their body as home.